Whether we are drinkers or not, most of us have seen the commercial for the beer where the actor ends each spot with the tag line, “Stay thirsty my friends.” Well, I was thirsty. So, while trying to do right by my body and drink more water, I filled up my water bottle with some cold H2O. At times I take quick sips while others require long gulps; today is already a long gulp kind of day. I could contain the water in the bottle and direct into my mouth and as the water gathered in the back of my throat I swallowed. That was the limit of my control. I could feel the water parting, coursing through both the left and right sides of my body. I didn’t know where the water was going or what it was doing. I couldn’t tell the water to go to my heart or parcel out equal percentages to my liver, kidneys or other organs. The water went where it was supposed to go and did what it was supposed to do. When I had finished drinking and the water had finished its travel through my body … responding to where it needed to go … a message was sent to my brain that my thirst had been quenched. I could continue on. 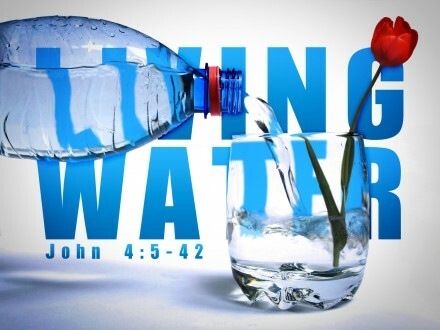 There is something else that moves like water … a living water … that seeks its own level … can’t be directed … but wherever it goes is exactly where it is needed and try as we might, just like water, we can’t live without it – the power of God’s Holy Spirit. Whether you are going through the difficulty of trying times or the exuberance that accompanies the best of times … you will get thirsty and you will need to be refreshed. Take the time. Drink it in. Choose to be blessed.